Willow Springs Learning Center four-year-old kindergartners and their families contributed generously to Sussex Outreach Services (SOS) this holiday season. Families and staff collected 300 gifts and students hand delivered them as a group to St. James Catholic Church where they sang songs before returning to school. The toys and gifts will be distributed within the local community. Lannon Elementary School students, families and staff members collected a brimming barrel of children’s new under garments, gloves, hats and gently-used winter clothing that was donated to SOS. Lannon staff sponsored a family for Christmas through SOS and generously donated gifts and gift cards to help them this holiday season. The Lannon School Girl Scouts troop collected 418 non-perishable food items in a “Stuff the Cart” food drive for the Sussex Food Pantry. Grades 3-5 also collected 100 items for the Sussex Food Pantry as part of their holiday program. Students decorated 280 paper grocery bags donated by Sussex Piggly Wiggly to be used at the Sussex Food Pantry Christmas Dinner distribution. Maple Avenue buddy classes in first and third grades earned money by doing extra work at home. A total of $441.62 was raised and used to purchase items for children served by SOS. Sixty fiction and non-fiction books were purchased for families to enjoy during the holiday season. Maple Avenue staff members sponsored a family of seven providing gifts, books, games, educational toys, arts and crafts, scrapbooking supplies, clothing, gift cards, snacks and holiday décor. Christina Garley’s fifth-grade classroom is collecting money for a charitable organization as part of its “Buck a Book” program. Marcy students collected $2,500 for the Stars and Stripes Honor Flight which will send five veterans on a future flight. Students were inspired by the veteran who spoke to them at the Veteran’s Day program. Kindergarten students donated money to Kayla’s Krew whose mission is to build an all-accessible and fully-inclusive playground in Franklin. First grade students collected 450 non-perishable food items for the Sussex Food Pantry. Second grade students collected toys and craft supplies for the Child Life Council (CLC) at Children’s Hospital of Wisconsin. CLC supports children and families master challenging events related to health care. Third-graders made cat toys and treat bags for animals at the Humane Animal Welfare Society of Waukesha County. In addition, they assisted the fourth grade with their book drive. 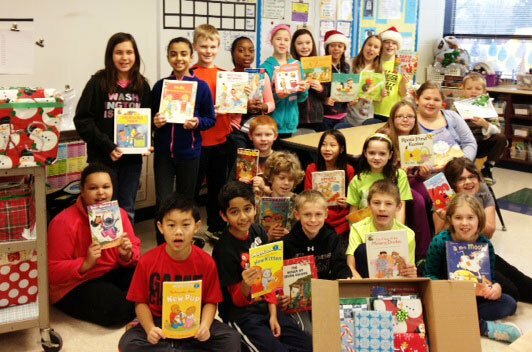 Fourth grade classes organized a book drive for Children’s Hospital of Wisconsin. The project was led by two fourth-graders and a parent. The girls spoke to each fourth grade class to get the drive started. Students responded generously, collecting at least four carts of books. Fifth grade classes collected donations for Charity: Water, an organization that brings clean and safe drinking water to people in developing nations. The collection is an extension of learning about the need for clean water around the world. Woodside’s SOS (Students of Service) Club made table decorations for Virginia Highlands Nursing Home and Christmas cards for the military. They are working on making fleece blankets for the Linus Project and mittens for a homeless shelter. Fifth-graders in Karen DeShong’s class are fostering Bridget, a 2-year-old guinea pig, in hopes of finding a forever home. They are reading to, feeding, giving water and playing with her each day. All kindergarten classes collected more than 50 gifts and gift cards for residents at a local assisted living residence which were distributed at the residents’ holiday party. Woodside families and staff members collected more than $1,800 before Thanksgiving to create turkey baskets filled with groceries for families in need in Milwaukee’s Notre Dame Middle School community. Woodside students were asked to donate money they earned by doing chores at home. Parent volunteers shopped for groceries to build the baskets. Items included a frozen turkey, bag of stuffing, jar of gravy, white and sweet potatoes, fresh vegetables, bread, canned cranberries, a fresh pie, beverages, appetizers such as crackers and nuts, along with an aluminum roasting pan. All of the items were put into a large sturdy laundry basket and delivered to families. Templeton Student Council conducted an after-school “Crazy Obstacle Course” which raised $151 for the Cancer Care unit at Froedtert Community Memorial Hospital in Menomonee Falls. Student Council also collected new children’s and young adult books for area families in need. Eighth grade art students sponsored their annual school wide collection of gently-used shoes that resulted in nearly 100 pairs of shoes being sent to adults and children in Africa. Templeton staff provided shoes, clothing, gifts and gift cards for several families in need. A Novel Idea book group’s “Snowflakes of Hope” program collected items for families in need. Students accepted donations for SOS and Project Concern in Cudahy. They donated sweaters, scarves, hats, gloves, mittens, toiletries and gently-used clothing. Club Action raised money by selling 200 bracelets of fair trade from Ghana. A donation of $1,200 was made to World Vision, an organization that helps support clean water initiatives in developing countries. In addition, the club volunteered at Retzer Nature Center. Students in Hamilton High School’s Freshman Seminar class sponsored a local seven-year-old through the Christmas Clearing Council of Waukesha County and students signed up to provide items on the family’s wish list. Students spent their homeroom period wrapping a total of 15 gifts for the family. German Club St. Martin’s Day Clothing Drive: To help people who are less fortunate and in the spirit of the German St. Martin’s Day tradition, the Hamilton German Club collected 986 articles of clothing, jackets and shoes. Items were donated to Red Door Clothes to be distributed to Waukesha families in need. German Club hosted the first-ever “Battle of the Clubs” coin drive. Students were encouraged to donate loose change to their favorite high school club during lunch periods for one week. A total of $150.56 was collected and used to purchase presents for the SOS Christmas gift distribution. German Club executive board members shopped and delivered gifts. Spanish Club adopted three Hispanic families with eight children total through the Christmas Clearing Council of Waukesha County. Students in all Spanish classes donated a total of $1,800 to purchase gifts for the families including winter jackets, clothing, toys, books and gift cards. Spanish Club members wrapped the gifts and the officers delivered them to the families. Colton Hilgart, Ryan Wall, Ethan Steinmetz, Zachary Brewer and Aaron Zillmer from Mr. Kersten’s Introduction to Machine Woodworking class made 30 wooden airplanes and six jewelry boxes to distribute to several adopted families for the holidays. HHS Cantabile and Concert Choirs sponsored a food drive for the Sussex Food Pantry. The drive was promoted in class as well as at their fall concert. Together the choirs contributed nearly 250 items to the Sussex Food Pantry in time for Thanksgiving. Dec. 4 – Power Test tree lighting ceremony;Dec. 5 – Third Ward tree lighting ceremony;Dec. 6 – Hamilton Education Foundation Charger Challenge: Santa Edition;Dec. 6 – Sussex Lioness Lunch with Santa; and Dec. 17 –Senior Lunch at the Sussex Community Center. National Honor Society held a November blood drive. At this event, more than 100 pints of blood were donated — enough to save 300 lives. Members also hosted several food drives to benefit SOS the week before Thanksgiving, producing more than 2,500 food items and $2,500 in donations. A card-writing and supply drive for Tricia’s Troops Cancer Connection resulted in more than 50 items to be used in comfort totes. Totes will be distributed to local hospitals for patients undergoing chemotherapy. Hamilton School Student Council adopted four children through the Christmas Clearing Council of Waukesha County. The children are all located in Waukesha and most are in single parent homes. Student Council members joined together to shop and wrap the gifts. Student Council also sponsored the annual No Shave Novembeard campaign during November. Hamilton male students pledged to go unshaven during November. Each participant obtained sponsors, usually other students, who pledged an amount for each day the young man does not shave or a flat donation at the end of the month. Proceeds were donated to Pancreatic Cancer Research. Hamilton DECA members shopped for holiday presents for the first grade class at Gaenslen Elementary School in Milwaukee. First graders at Gaenslen completed “All About Me” forms and Hamilton DECA members provided gift bags with at least one nice toy and other inexpensive gifts to these students. Gaenslen Elementary is located in a Milwaukee neighborhood that has one of the lowest household incomes in the state. Several of the first grade students are currently homeless. Students at Hamilton enjoy one of the highest household incomes in the state. In addition to delivering presents, Hamilton DECA took cookies and juice, and the Hamilton students spent an afternoon Dec. 10 with the children they shopped for, reading them books, putting together their new toys, and playing with them. This has become an annual event for Hamilton DECA and is always a heart-warming experience for the students who participate. The advisor and 36 students made the trip. Hamilton Charger football team members participated in a food pack for Waukesha Food Pantry and a clothing pack for Pine Ridge Indian Reservation in South Dakota. The “Tackle Hunger” food drive held at a home football game resulted in six 52-gallon bags of non-perishable food items and a $187 donation to Sussex Food Pantry. During the Christmas season, team members volunteered at the Charger Challenge: Santa Edition and shared cookies and carols with the residents of the Sterling House in Sussex. Offices A, B, C, Publications and Health Room – High school staff members adopted a family in lieu of exchanging gifts with one another providing them with many items to brighten their holidays including wrapped gifts of toys, games, clothing, personal items, household goods and gift cards for families in need.